McBASTARD'S MAUSOLEUM: Now on DVD and Blu-ray from Full Moon... PUPPET MASTER: AXIS TERMINATION! 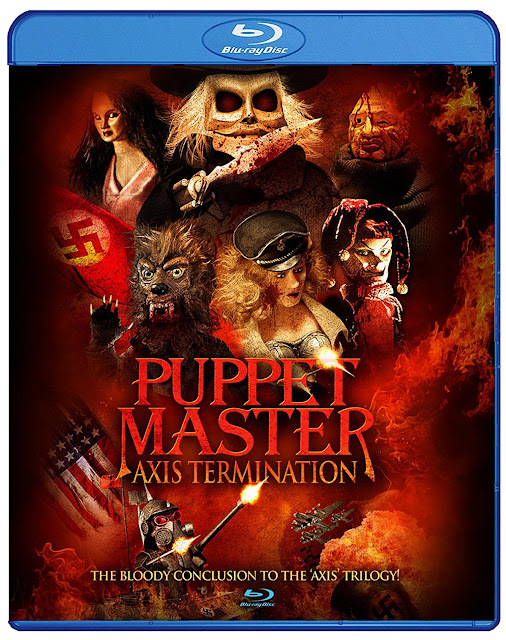 Now on DVD and Blu-ray from Full Moon... PUPPET MASTER: AXIS TERMINATION! 11th entry in Full Moon's killer puppet franchise is the weirdest and wildest one yet! There are but a precious few horror and fantasy film franchises that have continued to endure and evolve over multiple generations, let alone one with the same creative mind consistently behind it. But producer Charles Band has been steering the Puppet Mastercinematic ship since its maiden voyage back in 1989, with the hit high-concept thriller Puppet Master. Over the next 28 years and 10 official films, Band has taken his malevolent marionettes on many magnificent, macabre adventures and now, he's set to unleash the weirdest and wildest Puppet Master movie yet! Buckle in for Puppet Master: Axis Termination, the 11th film in the series and the final chapter of the Axis Saga, which began with Puppet Master: Axis of Evil and continued with Puppet Master: Axis Rising. In it, everyone’s favorite pint-sized puppet anti-heroes — Blade, Pinhead, Tunneler, Jester, Six Shooter, and Leech Woman — join forces with a secret team of psychics working as Allied Operatives. Teaming up with Toulon’s bloodthirsty marionettes, these unlikely allies face off against a new pack of evil Nazis and their even more malevolent Axis Puppets in a showdown that will decide the future of the free world! Puppet Master: Axis Termination on Blu-ray and DVD is now available from Full Moon Direct and will be available via Amazon on November 27th. Order your copy today!